This Elstead Windsor single wall light in gold patina finish with crystal drops is made in Britain and features a circular wall mount and ornate frame, with a curvaceous arm, candle style light and faceted crystal decoration. The candle light is fitted with a metal candle pan, candle tubes and boasts crystal drops hanging from the lamp to add a sparkling finishing touch. The Windsor collection is inspired from royal symbols within our English heritage. This wall light is hand crafted in Elstead Lightings UK factory, adorned with cut glass crystal jewels and hand patinated in a rich golden finish. There are optional gold mushroom pleated fabric shades available (LS166) to help create a more classic and opulent statement piece. Please see the secondary images below for details. Please note that if shades are used the maximum wattage per lamp is reduced to 40w. The classic style, gold patina and faceted crystals combine to create an eye-catching focal point that is ideal for any traditional or period setting. 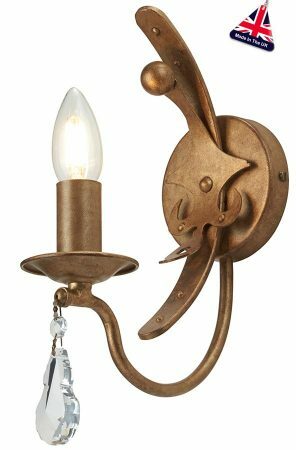 Ideal wall lighting for a hallway, dining room, in a bedroom or living room. There are matching fittings available in the Windsor collection that includes a table lamp, three-light wall fitting, a duo mount ceiling light and four, six and twelve light chandeliers; please see below for the complete range. 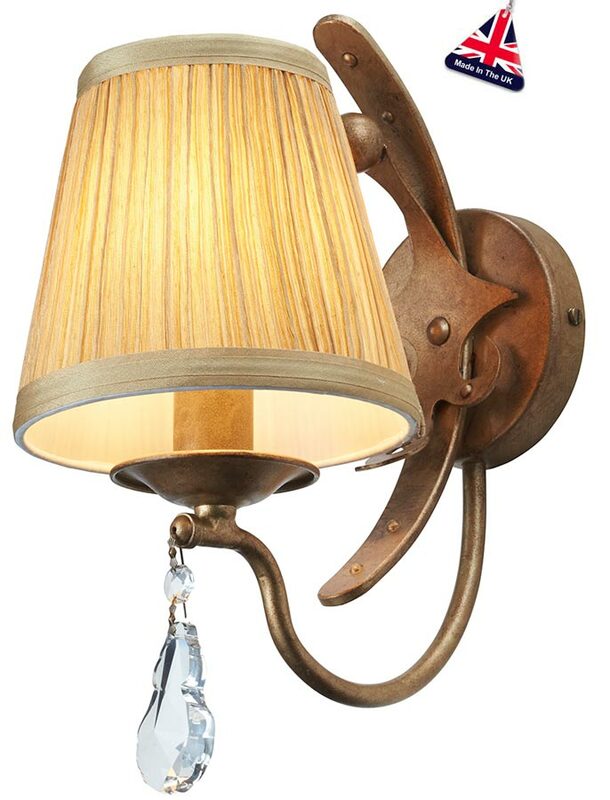 This classic light is supplied by Elstead Lighting, a British company that specialise in the manufacture and distribution of quality decorative lighting such as the Windsor single wall light in gold patina finish with crystal drops you see here.